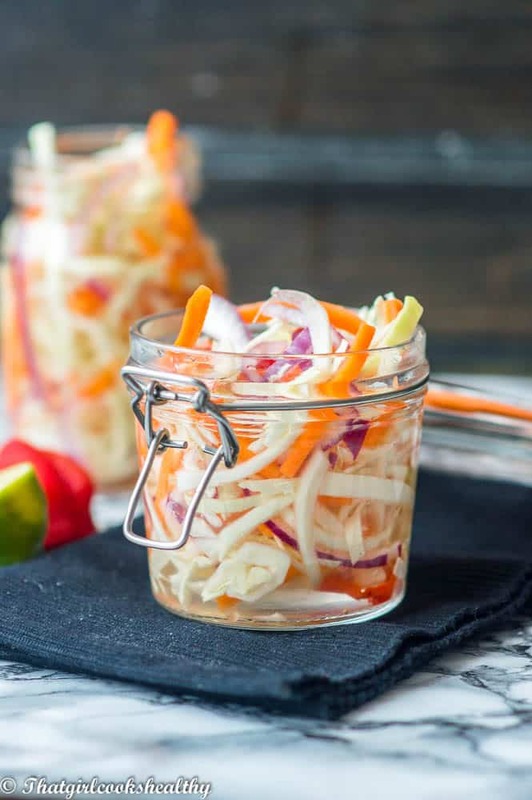 Haitian pikliz recipe – a delicious tangy Caribbean spicy slaw made from cabbage, carrots, shallots, scotch bonnet, lime and pickled in vinegar. 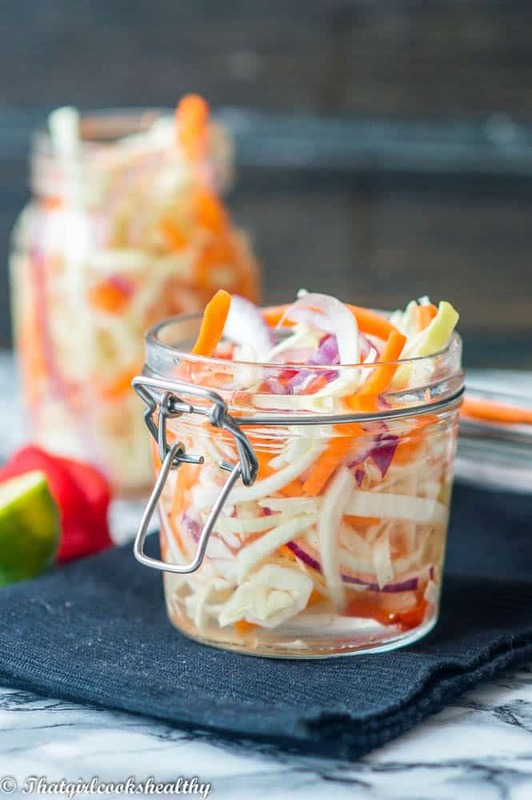 In short pikliz is a popular Haitian food, it’s a spicy pickled slaw made from shredded cabbage, carrots, shallot/ onion, scotch bonnet, white vinegar and the juice of a lime. Some individuals jazz their pikliz up with other ingredients like peppercorns, bell peppers and garlic. This fiery dish is served as a condiment to other Haitian dishes such as griot (fried pork) chicken (poulet) or tassot (goat or beef) so it really plays a staple role at meal times. When I first made pikliz I didn’t know what to expect, but I do remember my first impressions. I thought the condiment reminded me of a Caribbean version of kimchi. Nevertheless, I gotta say I was pleasantly surprised by the taste. 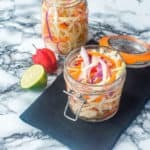 The crunch from the cabbage and carrots and the zest of the lime with every bite and the heat from the scotch bonnet. Trust me that is heaven on earth for me, can we say 10/10. The Haitians really struck gold with this pikliz dish, it’s currently on rotation at the dinner table with my Jamaican food. A nice bit of Ja-Haitian going on, Caribbean fusion food at it’s best. It’s really simple to make and there’s not many ingredients to contend with which is a good thing. Cutting the cabbage and carrots – I used half of a large cabbage which works out to be roughly 2 cups worth. I cut the cabbage lengthways to achieve those shreds. The carrots I skillfully julienned by hand, use a julienne peeler, if your knife skills aren’t the best. Shallots – you don’t need too many shallots, in fact one should be suffice. If you don’t like the taste of shallots use a regular or red onion instead. Scotch bonnet – this is the best part for me. If you don’t like heat simply skip using it or discard the membrane (the seeds) which is where the heat lies. Please be very careful when handling the peppers, use gloves if you must and do not rub your eyes. Toss the ingredients – use tongs to toss the ingredients together so they are combined. I like to add the pink salt and lime juice now before moving onto the next step. Storing the pikliz – typically Haitians like to preserve their pikliz in a sizeable jar. First the vegetables are added and packed into a jar then the vinegar is poured into the jar. Use enough to fill 3/4 of the jar. 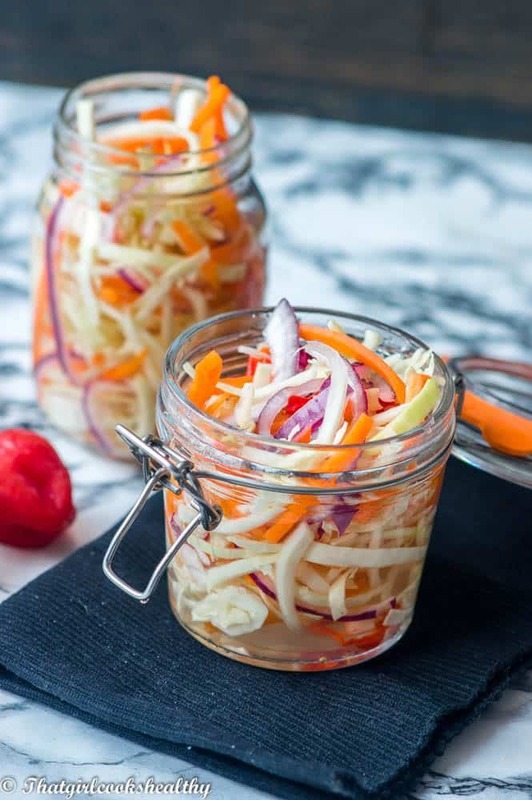 Pulse the scotch bonnet pepper with some vinegar and pour over the slaw if you don’t care to eat the pieces. Add the shallots and scotch bonnet to the vegetables and use tongs to toss them together. Add the pink salt and squeeze the juice of a lime on the vegetables before adding to a jar with the vinegar. Pack the vegetables into mason jars (might need 2-3) evenly and pour the vinegar so it fills roughly 3/4 of the jar. I am going to make this recipe, it’s perfect as I prefer salads without dressings and it is sugar and oil-free yet has flavour. I’ll make one with some herbs also. I will probably have to make several jars for a continuous supply – how long can they be stored in the fridge for? Herbs are definitely a great addition. I like to add some thyme to mine sometimes. You easily store it in your fridge for upto a month. I find the flavour more intense as the pikliz ages, similar to a fermentation process.